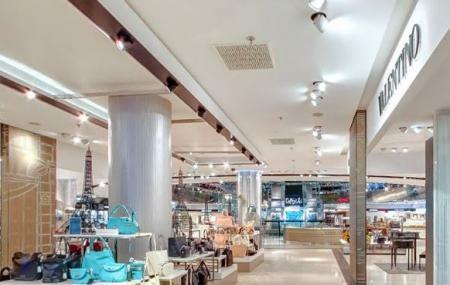 Galeries Lafayette Berlin is easily one of the most well known brand chains of departmental stores. Originally a Parisian store, the brand spells luxury. It is famous for its high end fashion brands and ornaments. The building by itself is also quite a treat to watch and that’s why Galeries Lafayatte is always bustling with people. Apart from the store it also houses a bookshop which has only French literature and a patisserie which is known for its amazing macaroons as well as out of the world pastries. So shopaholics, literature lovers, and dessert lovers- it serves as a perfect place to visit for all the aforementioned. How popular is Galeries Lafayette Berlin? People normally club together Martin-gropius-bau and Karl-marx-allee while planning their visit to Galeries Lafayette Berlin. Visit the Café in the basement for some exquisite French treats. The coffee is also great. One minus point for the limited number of seats/ tables for enjoying the treats. Great food with a lot of choice. Women dresses are mostly small size (0 or 1). We could find any size 3 or 4. Many of the attendants speak French. Nice clean, bright and modern store. Really cool 'Metropolitan' line sign adding a nod to its Parisian roots.